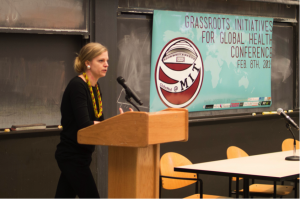 A few weeks back I attended MIT’s Grassroots Initiatives for Global Health Conference, and I was very grateful to share some lessons on global health advocacy as a speaker during their break-out sessions. The conference brought together some amazing thought leaders in this field right now, like Jon Shaffer at Partners in Health, Liana Woskie of the Harvard Initiative on Global Health Quality, and Peter Luckow of Last Mile Health (Jon and Peter are both Northwestern alums). 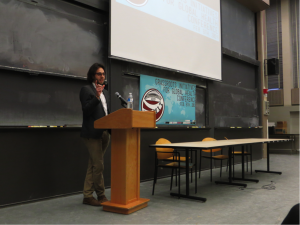 This conference stands out from many others for undergraduates because of its unique focus on bringing in an audience of current global health professionals. In my session alone, students were only half the audience. 1. The HIV/AIDS movements, which began as a series of direct actions, became one of the most effective grassroots health movements in history. On the night of April 15, 1987, hundreds of people were filing last minute tax returns at the New York City General Post Office, when AIDS activists filled the building with their SILENCE=DEATH slogan. Their demonstration was widely broadcast over media and began to challenge the overwhelming public apathy towards the HIV/AIDS epidemic at that time. Out of indifference and hate, they created partnership and hope. Anyone who watched the HIV/AIDS movement unfold witnessed people take back power over their health and demand that decision-makers listen to those who were directly affected by the crisis. These direct actions and the political will they produced eventually led to the Global Fund and PEPFAR, which radically changed what was possible in the field of global health and development. 2. However, the HIV/AIDS movement was almost two decades ago, and we have seen power insidiously re-centralized behind closed doors. The pharmaceutical and health insurance industry have spent more than $3 billion dollars combined over the last fifteen years. The industry’s main lobbying arm – The Pharmaceutical Research and Manufacturers of America (PhrMA) – by itself spent more than $200 million dollars over the last ten years on lobbying efforts (for comparison, that’s about 1.3 times greater than what the entire oil and gas industry spent on lobbying in 2011). Moreover, the pharmaceutical and health products industry spends more than every other U.S. industry on lobbying, and in 2012, the pharmaceutical industry alone spend about $440,000 per member of U.S. congress on lobbying. This money continues to push people into poverty due to health care costs and keep essential medicines out of reach from the world’s poor. Unless we shift public discourse from viewing health as a commodity to health as a human right, we will not see fairly priced and accessible medicines and healthcare technologies in our lifetime. 3. Youth have the power to shape the next era of global health and development – and we need to seize this moment to raise our voices, engage in policy, and act in solidarity. One of the largest critiques of the Millennium Development Goals (MDGs) was their failure to include voices from the marginalized populations that the goals aimed to serve. In its post-2015 thematic consultation paper, the International Planning Committee for Food Sovereignty stated, “the major limitation of the MDGs by 2015 was the lack of political will to implement due to the lack of ownership of the MDGs by the most affected constituencies”. Unfortunately, the post-2015 policymaking processes are also under fire for the same problems of accountability. During my break-out session, I spoke to an audience of young professionals about my engagement with Article 25, a new campaign working to generate grassroots momentum and public support for the right to health in the post-2015 agenda. This October 25th, we’re working with young activists across the globe to organize the first Global Day of Action for the Right to Health. Collective action will enable these groups and individuals to come together and show – for the ﬁrst time – the true breadth and power of this right to health movement in order to hold politicians and policymakers accountable. Overall, the conference was an energizing experience and inspiring launch for the campaign.